Exciting news! 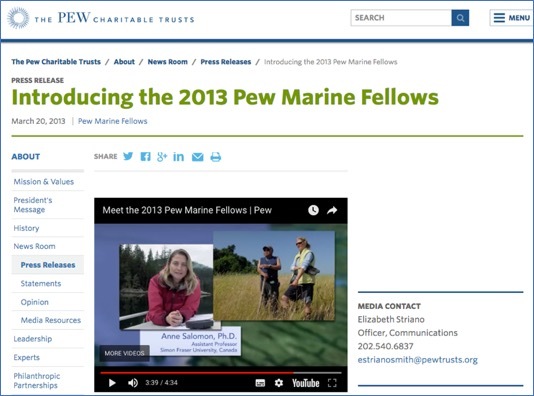 Anne has been awarded a Pew Fellowship! This award carries a dollar value of $150,000 and will be used to initiate the ‘Coastal Voices’ project which will examine the cascading effects of predator recovery on coupled human-ocean ecosystems. The first step now will be to do more listening and learning. It is important to seek out the advice and opinions from coastal Indigenous leaders and communities to find out how they envision addressing these complex issues and how they can be partners in leading this important work.